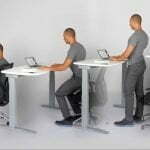 We create optimum working environments, with products that are Australian-designed and manufactured. Standout products are corporate task and executive seating, educational furniture, loose break-out furniture and Aged Care / health-Care furniture solutions. We’re well known among our A&D clients for our customer service – often, designers ring us directly because they know we follow through and offer exceptional customer service which directly benefits their relationship with their clients. Something we didn’t know about Nexus? 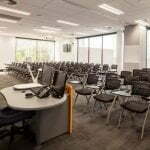 Our factory capabilities enable us to project manage large fit-outs anywhere in Australia. The Domino chair with height-adjustable lumbar support, armrests and upholstered seat.